Asbury Memorial United Methodist Church, Savannah Georgia, Sunday Service, September 25, 2016 ... Sermon by Billy Hester ... Audio Version ... "How's Your Salt Level?" 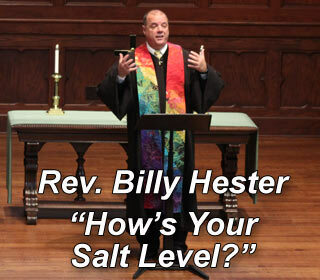 Sermon: "How's Your Salt Level?" You can Start this media presentation in your stand-alone Player by clicking on this link or simply, RIGHT MOUSE CLICK HERE and SAVE TARGET AS. This will save the audio file on your computer. To play, go to the location on your computer where you saved the file and double click it. It should then play non-stop. Sorry, this browser does not support the mp3 audio element. This site is optimized for Windows Media Player. If you are not using Windows Media Player 11, we recommend that you click here to download the latest version for your operating system. Join us at 11:15 AM for a unique Sunday worship experience that will make a profound difference in your life!